I really like a good tuna salad sandwich, but the kind of tuna I like, the solid white albacore, has even more mercury (nearly three times as much, I recently read) than the light tuna from the smaller skipjack. And sometimes I just like to eat vegetarian. So I started looking through the pantry to see if it would spark an idea for a substitute. 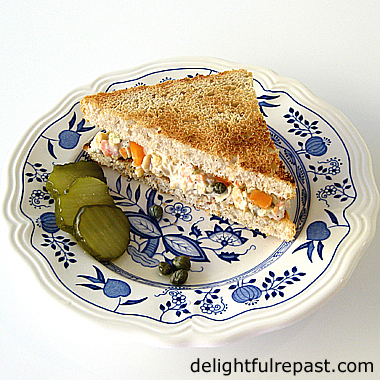 First thing I spotted was a can of organic garbanzo beans (also called chickpeas), and I thought, hmm … chopped up and mixed with my favorite tuna salad ingredients … And, of course, it would make a delightful tea sandwich, especially when there’s a vegetarian on the afternoon tea party guest list. Then I decided to google it. And shoooot! It’s already a “thing.” Anyway … I don’t mind. If something’s a good idea, it’s a good idea, even if somebody else already had it! And, no, it does not “taste just like tuna salad.” Similar, due to the other ingredients, but it’s not going to fool anyone. It tastes good, and that’s what counts. But if, like Mr Delightful, you insist on the real, not faux, thing, here’s Tuna Salad. What do you think - are you ready for faux tuna salad? This sandwich was made with my Sourdough Sandwich Bread we always have on hand. 1 Turn your rinsed and drained garbanzo beans out onto a cutting board and chop them coarsely with a large knife. You’ll notice the skins coming off the beans. You don’t have to, of course, but I found myself unable to resist pulling the large pieces of skin out of the pile and discarding them. And I like to put a half cup or so of the beans into a small mixing bowl and mash them up before adding the chopped ones. Note: How finely you need to chop the garbanzos and vegetables depends on whether you are making regular sandwiches or tea sandwiches. 2 Add remaining ingredients. Stir well. Taste and adjust seasoning. Cover and refrigerate. What a great idea! That sandwich looks perfect, Jean. Thanks, Angie. It IS delicious, and it has a great texture. What a great idea, dearest Jean, you're truly an artist as for cooking, your recipes have always something special, thank you! This is brilliant Jean!! But it's already a thing?? Really? I'm pretty sure I would like it better than tuna. I'll try it! Thanks. Thank you, Judy! I'm so glad you're going to try it. Do let me know what you think. Of course, some people like a bit of onion in their tuna, or in this case faux tuna, sandwich, but I can't eat raw onion, so ... But I do think the ingredients I prefer are a lovely combination. Well I'd be more than willing to try this faux version, Jean! Thanks for sharing your idea, which may not be new, but it's new to me!! Thank you, Kitty. It's a good one to keep in mind in case a vegetarian or vegan comes to lunch or tea! It seems good,Jean!But I like the "true" tuna so much...I love your darling post about your mother in law and her recipe too!Hugs!PS-I love that plate too,a classic! Well, I too love tuna sandwiches and I must have the real thing. I always use light tuna packed in water rather than oil. I also looked up your lovely tuna melts and I make something similar only I use hamburger buns. I never thought of English muffins and I think I will use them next time as they would give the sandwich more of a crunch. My kids love them and I always make them when they come home for a visit. The two guys that live away have my recipe but they like it when Mom makes them for them. I am always happy to oblige. It's such a pleasure to stop by and see what you're serving up, Jean. Martha, thank you. And, yes, it's pretty scary! Sandi, thank you so much. I think you're going to like the English muffins a lot. And I know exactly how your sons feel - everything just tastes better when Mom makes it! I would eat a chickpea salad sandwich if it were billed truthfully, but I must admit I do like canned tuna... Probably the worst kind, from any perspective, but it's what we grew up on so it's what I still like. I'm a rube that way. I've never tried fresh tuna, but I TRIED real salmon, repeatedly. I stuffed it and baked it, even BBQ'ed it, and Everyone liked it - except me. Give me a can of dog salmon (with the bones cooked inside so they just barely crunch in your teeth) & a jar of mayo, some onion, & I'm a happy camper. On white bread please. Total rube. I too like the real thing but I do think this is clever. My son makes all sorts of things with beans so he would go for this for sure. There is a need with so many going vegan! Thanks for sharing. Thanks, Bernideen. Let me know if your son tries it! I once had a guest at afternoon tea I did not know was vegan; she didn't mention it beforehand. I could have whipped this up for her (minus the real mayo, of course). I didn't realize that you can have a faux tuna salad sandwich. I'm willing to try it! Give it a go, Margie! Who knows, it might come in handy for one of your socials, if one of your co-workers goes veggie! Oh my goodness, one learns something everyday from dear bloggy friends... like a "faux tuna?" Oh well, and I love garbanzos or checkpea. Thank you for this recipe and for your sweet comment. I think I would enjoy it if I don't call it tuna but call it a tea sandwich instead. Thanks for trying it for us! Thank you, Fabby! Hugs to you. Ellen, yes, let's just call it a tea sandwich! For some reason, I just flashed on that crazy Mock Apple Pie made out of Ritz crackers - yikes! 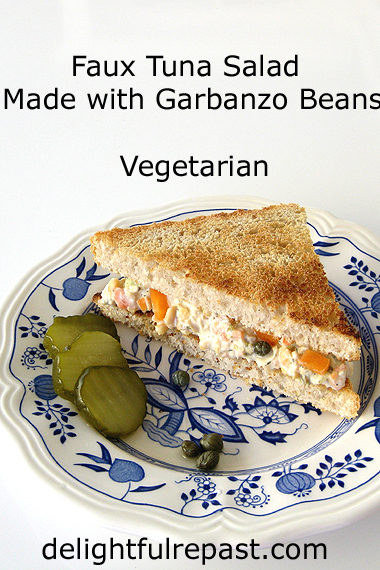 I LOVE garbanzo bean and never thought to make a faux tuna with it! Since I have many can of the beans in the pantry downstairs I'll be trying your recipe soon. Thanks for sharing! Cathy, that's great! Come back and let me know how you liked it! I think I'll stick with the "real" tuna sandwich - but it's nice to know that there are delicious alternatives if you feel like a change or don't "do" fish. Oh Jean, this is perfect for me! I am always looking for new vegetarian recipes to try so we can cut down on the meat we eat AND I love chickpeas! Thank you so much for sharing with us at the Hearth and Soul Link Party. Sharing on Twitter and on the H&S Facebook page. Have a lovely weekend! Thanks, Leanne. I'll probably have the "real" more often, only because Mr Delightful doesn't "do" beans! April, thank you. I'm so glad you like it, and your social media shares are soooo appreciated! Definitely works for me: looks delicious. I read a book recently (set in Scotland in WW2) and characters were cheerfully making sandwiches with beets as the main filling. I tried those too and they were perfectly tasty! Thank you, Pauline. I do like beets as well, but I think the beans have even more protein. The way the people dealt with the privations of WW2-era Britain is admirable! Thanks, Polly. And he'll be delighted that others agree with him! This sounds good enough to have its own name, Jean - Chickpea Salad! We will definitely want to try this. I'm using a lot of chickpeas (as we call them over here) at the moment in all sorts of dishes (mixed into turkey meatballs tonight) since I came across some lovely Spanish chickpeas in jars. So far I haven't used them in a sandwich but this will be such a good way to use up the remains of the next jar. I had no idea it was a "thing" but, then again, nobody has ever accused me of being on trend. Thank you, David. And I think you're right - I rather regret not using that name, too, in the post title! Phil, I'm definitely not on trend either. In fact, if I know something is very trendy, I go to great lengths to avoid it! If you're the same way, don't be put off this recipe because it's really not that much of a "thing"! Thanks, Diana! I hope you'll give it a try. Looks delish! I'd love to give it a try. Thanks, Veronica. If you do, please come back and tell me how you liked it. Thanks so much for stopping by and for taking the time to comment on my post about blogging!! I will continue to post but not as often as I was....... Thanks for your encouragement and support!! Debbie, thank you. I really enjoyed it and will make it again soon. Happy blogging! Hugs. Oh, Zaa, that makes me so happy. And I hope you'll come back and tell me how you both liked it AND what wine you drank with it! What a great idea to make "tuna salad" from the chickpeas. I'm going to have to try this! Thanks, Carol. I really enjoyed it on toasted homemade sourdough bread. Would also be good, I imagine, on dill rye. Hi again, Jean! Just popping back to let you know I've featured this post at the Hearth and Soul Link Party this week! Hope to 'see' you there when you get a chance. Have a lovely week! April, thank you so much! *Much* appreciated! I'm a fan of the garbanzo bean, so I wouldn't definitely try it. Thanks for the idea. Cool, Christie! Let me know how you like it! What a wonderful substitute for tuna! Thanks for sharing your recipe with SYC. Thanks, Jann! Wish Mr Delightful wasn't slightly allergic to beans - he eats waaaay too much tuna. Great dish! Love how versatile beans are. I make something a bit similar, but just a bit -- gotta try this, it looks SO good! Thanks. John, thank you! I hope you and Mrs Riffs will try it soon. Thank you, Kate. And it seems vegans have more choices than ever and more information! I like this idea. No it isn't the way I make tuna salad but I sure don't mind calling it something else! I know you have masked your title with a bit of French ,but, don't you feel even a little guilty actually using the word, Tuna, Jean? In the world of trade and diplomacy it could be a stumbling block!! The BREXIT negotiations could have nothing on international relations repercussions compared to your use of the word, TUNA!! Ha! Ha! It sounds delicious Jean. I can think of a new title though. " Kidney bean, lettuce, tomato mayonnaise and mustard sandwich," catchy what? How about that? I love Dijon mustard!!!! Ha! Tony, I wouldn't want to cause international repercussions with my humble little food blog -- perhaps I'll just call it a Chickpea Salad Sandwich! Thank you, Lucy! I hope you'll try it sometime and let me know what you think. Thanks, SLP! Let me know if you try it! I'll definitely try this! Thx for sharing. Chris, wonderful! I hope you'll come back and let me know how you liked it!